I need to stop being such a Debbie Downer. Grr. Positives, okay... Hmm, well, this is a moderately successful blobicure, which I have never done before! That's good, right? :) And I did get a mani done today, so that is a success I can acknowledge too. So that's two positives. Just gotta keep in that mindset! Yess! So let me tell you a bit about this manicure... I started off with a thick coat of Color Club Astro-Naughty because I wanted something other than boring white, and then I did my blobs with Nicole by OPI Daffy Dill, Hit the Lights, The Right Thing and Oh That's Just Grape! I decided that wasn't quite enough so I took the risky choice of adding a bit of pink with Color Club Jackie Oh! 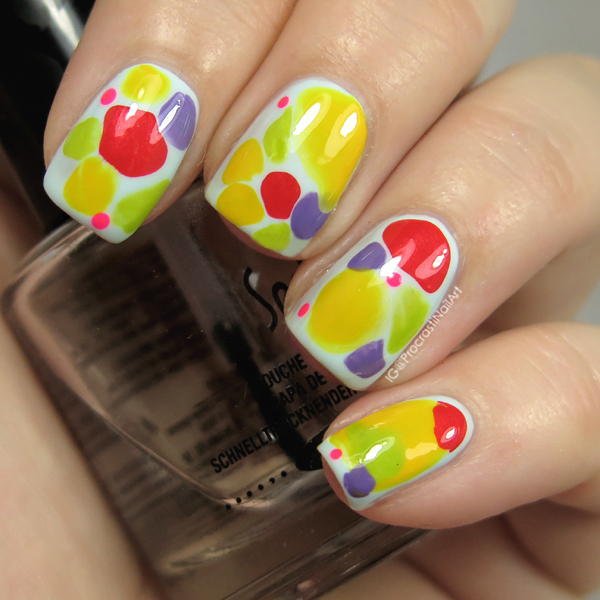 dots. Too much? Doesn't matter, it's done now! So I like this mani but I definitely don't love it - I feel like I could have done something a bit more creative, but oh well. Tomorrow is another day! I've never done a blobicure, I'm definitely inspired to do one now. It took me a bit to get the hang of the technique, but it's a fun look when you get it to work! :) You should def try! This is giving me awesome lava lamp vibes girl! I actually really dig it! I think these are really fun!! The colors look lovely together! 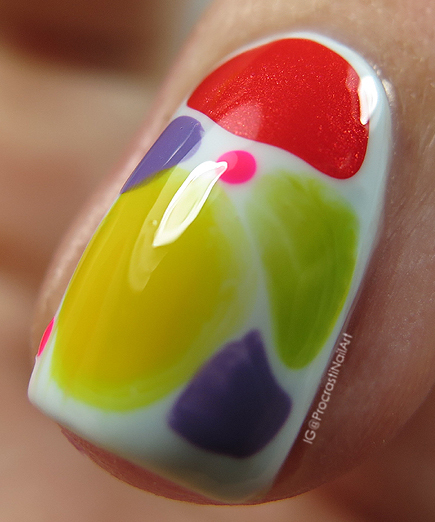 This blobicure is super fun especially with all the bright colors. I have absolutely adored everyone's different takes on each decade. This just might be my favorite week from the Digital Dozen! 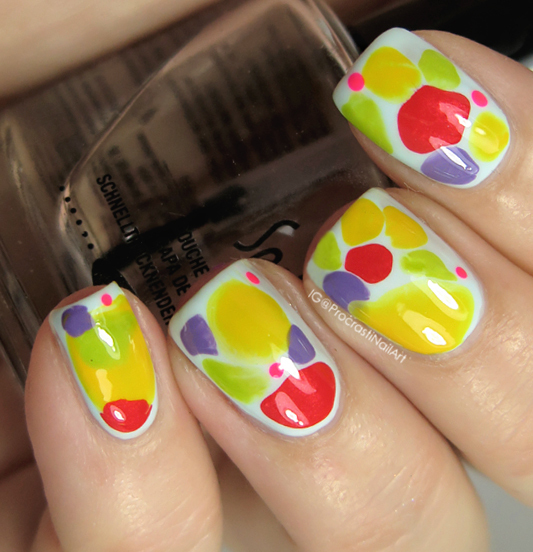 This manicure is so playful! I know how you feel, I just had like a week where I hated every nail art I did. I think it's over now though, so hopefully you'll also love the next one you do! I think it's super fun and the blobs came out so well! And the pink was a perfect touch. So fun and retrok, reminds me of Austin Powers! Perfect for the theme; you'd never know you have any block! 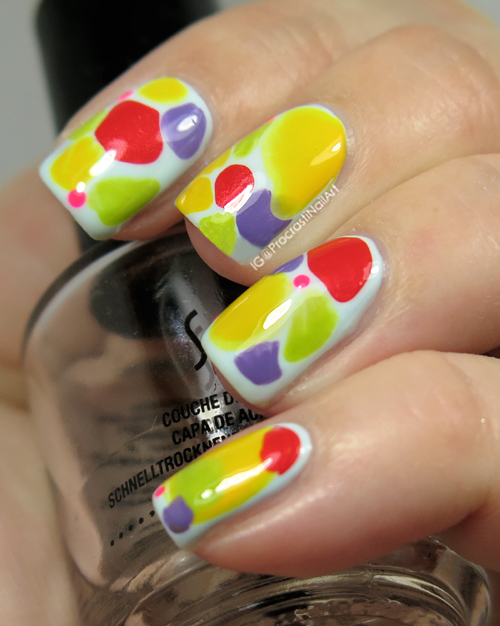 I can totally see the lava lamp idea in this mani!